The island area is about 160 square kilometres. Easter Island is acknowledged the highest point above the ocean level. It is situated on a huge elevation called the East Pacific Rise. 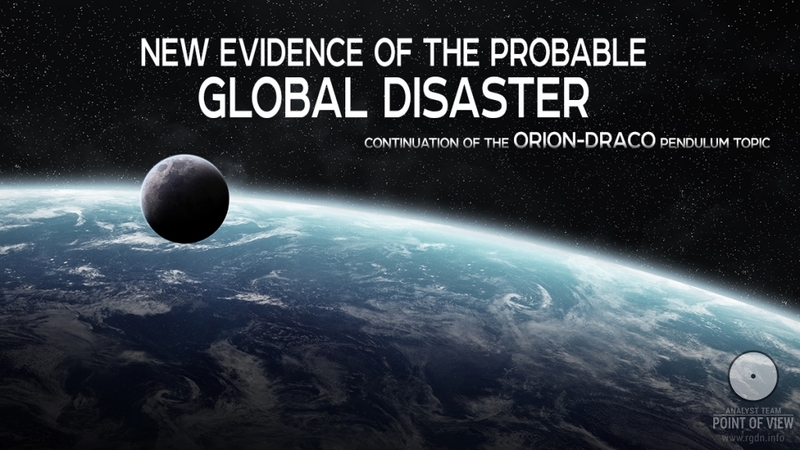 For this very reason Thor Heyerdahl once wrote that the Moon was the closest dry land seen by local inhabitants. The island capital and only city is Hanga Roa. 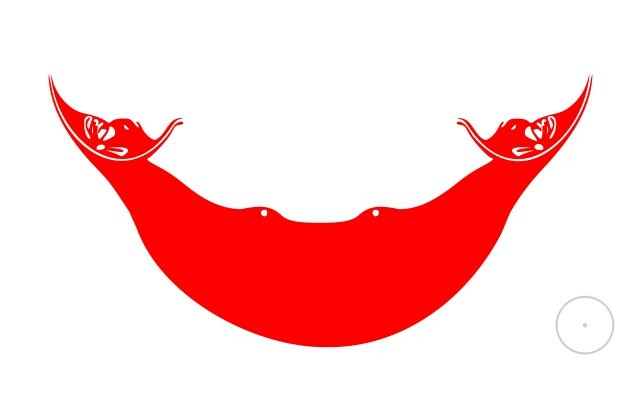 The island has its flag (Figure 3) and emblem (Figure 4). 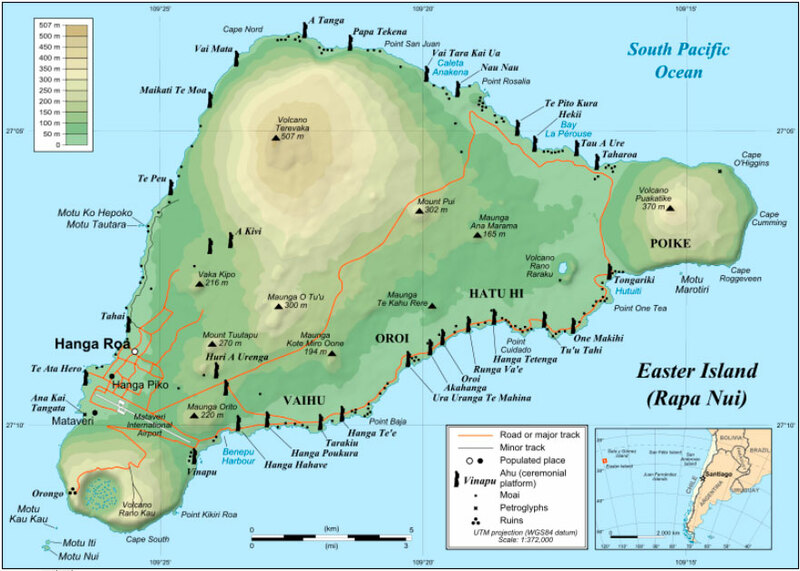 Quite interestingly, Easter Island has / used to have several names: Vaihu, Mata-ki-te-Ragi, San Carlos Island, Rapa Nui, Teapi, Tekaouhangoaru, Te-Pito-o-te-henua, Hititeairagi, and Easter Island proper. Interesting data about underwater exploration of the ocean floor near Easter Island leads Australian Howard Tirloren, who arrived here along with Cousteau. He told that, when they arrived here in 1978, they studied in sufficient detail the bottom around the island. Anyone who fell down in the submersible, confirm that the mountains under the water, even at a small depth, have quite an unusual appearance: some of them even have holes that resemble connectors for windows. Moreover, once Jacques-Yves Cousteau found a strange deep cavity nearby where he dived for three more days. When he returned, he wanted to explore the cavity even more scrupulously. Cousteau failed to discern anything in full dark, but in his words at the bottom there were silhouettes of walls forming something like a section of a city. However, because of the people serving in the political police DINA supervised by Augusto Pinochet, it did not work. As Tirloren claims, they were forced to endorse non-disclosure documents, and demanded to stop the investigation, so all work was terminated. Yet, what may be so unusual in that cavity? It still remains a mystery why Chilean security services were so afraid of scientists then. After the Pinochet’s regime the issue was raised again, but to no avail. Thus, this fact does not preclude an assumption that a large part of Easter Island sank during a disaster. The obtained geophysical data indicate the Southeast Asian coast is slowly descending into the ocean. Perhaps, the submersion was faster in ancient times, and once the land (like Atlantis) went into the ocean depth, including Pacifida with its enormous population and original culture, traces of which are still found on Easter Island? At that, could diverse plates with inscriptions and monuments of art be nothing but preserved evidence of an ancient extinct civilization? As a matter of fact, according to the first Easter Island settler Airo, wooden plates and sticks containing hieroglyphs and symbols were placed in all island buildings. These are mostly images of unknown animals which are still painted by local natives by means of stones. Every image has its meaning, but since such items are very rare, we can assume the hieroglyphs represent only remains of an ancient script. That is, natives only try to follow ancient traditions, not intending to find any sense in them. Macmillan Brown in his studies even attempted to determine an approximate date of the Pacifida ruin. In his opinion, such event could happen between 1687, when the English sailor Davis discovered a big ledge near Easter Island, and 1722, when Admiral Roggeveen failed to find anything in this place except a small island. The possible cataclysm may be proved not only by the sudden termination of works at Rano Raraku stone quarries. In many parts of Easter Island there are spacious paved roads leading into the ocean. Could this mean the roads end deep under the water? May we actually once find new evidence of a lost culture at the ocean bottom? There is a point that totally destroys the hypothesis – it is chronology. When did the dry land in the Pacific Ocean begin to sink? Three hundred years ago, three thousand or even three hundred thousand? Or perhaps the number is in millions? Geological and geophysical data indicate the dry land submersion and the Pacifida collapse took place quite long ago. Fauna and flora of Galapagos Islands, New Zealand and Fiji Islands are very similar, given that many centuries ago these lands were components of a single huge continent. For this reason there are minerals here which disappeared long ago and are found nowhere else in the world. In a similar way the Australian continent once broke off from Asia. The dry land submersion in Easter Island area didn’t take place since that ancient period. Geological and oceanographic studies performed by Lawrence Chubb near Easter Island proved that the island had not descended by a single millimetre, and when its monuments had been erected the coastline had been just as stable as today. The same conclusion was made by the Swedish expedition that ascertained the island’s geological stability for at least a million years. Investigating the island origin, the article author has got an impression that many scholars intend not to reveal the truth, but rather to defend their own point of view and prove what’s beneficial for them personally. Or, if they undertake an absolutely impartial quest, they face postulates imposed on the society today as official ones, which though fall apart at the seams even on the most perfunctory verification. This forces researchers to turn their studies from the direct way to thorny paths of the official labyrinth. At that, it’s obvious most researchers evaluate available artefacts only from the perspective of matter predominance over spirituality, and in no other way. In the process of the subject investigation a number of questions arose. Why do scientists, when they encounter inexplicable archaeological artefacts and just as inexplicable behaviour of government authorities that publicly prohibit relevant studies, neither sound the alarm in any way possible nor try to report obvious things to the community? Why don’t they build hypotheses that would take into account real finds and facts, not just convenient or comprehensible ones? How can they often think up their theories in order to make them look more complete for the public? Isn’t it interesting for them to learn the real past of our planet, or they simply lack time for this due to their routine affairs and problems? As a matter of fact, who needed to build multi-ton statues on the tiny island in the middle of the ocean, put them along the island perimeter, face towards the ocean, and cover with ornaments and patterns? What was so special about the local script, if the first Europeans who visited the island and saw it started hastily eradicating it among the local population so that forty years later nearly no Pana Nui inhabitants were able either to write or even to read their own home plates? One can argue this was accidental and as long ago as in the 18th century. Well, OK, but why aren’t excavations and studies carried out at the governmental level nowadays? Why today, if a person crosses the barrier and approaches a statue, he or she may get imprisoned? And why has UNESCO prohibited excavations and examination of the underground part of the statues? Another interesting point is that almost all contemporary researchers of the distinctive culture of Easter Island assert the impossibility to discover the culture genuine meaning or decipher the local script, while everything they did decipher are mere texts dedicated to everyday life. 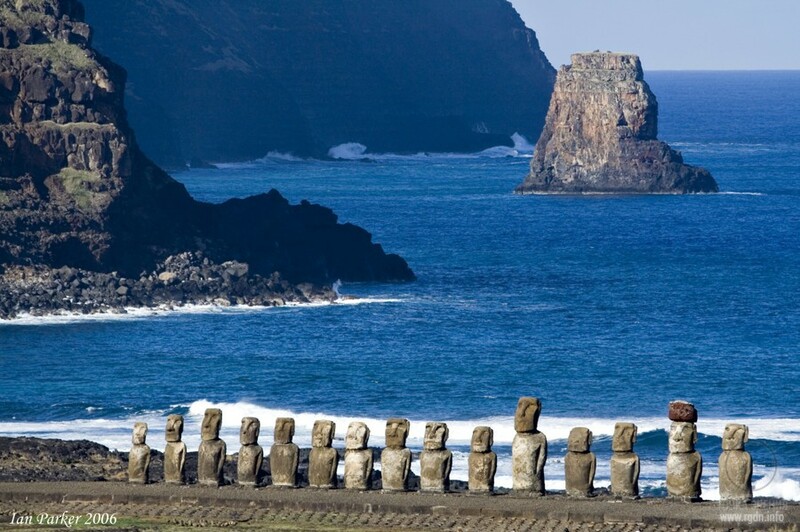 In 1722 Easter Island was attended by English circumnavigator James Cook and French explorer Jean-François La Pérouse. Much changed over a half a century after the arrival of the first settlers. Many valleys were abandoned. Local inhabitants who used to be a picture of health now led a miserable life, while nearly all majestic statues were knocked down and lying on the ground. The ancient cult was razed from their memory. Just a few representatives of the famous “long-eared” race remained, and most probably their downfall was due to their rivals – the “short-eared” who destroyed not only the tribe, but its inherent culture, too. As a result of such events a whole epoch ended in Easter Island, which had lasted for many centuries or maybe millennia. What that epoch was like is still a mystery for many. Roggeveen and his assistants learned almost nothing about it. Captain Cook, La Pérouse and the Spaniards who discovered the island in the second half of the 18th century showed no interest to ancient artefacts – they only looked for new territories to be explored and colonized. By the time when European researchers finally became interested in the cultural heritage of other nations, on Easter Island only silent witnesses of its magnificent past remained – the huge breathe-taking statues. Now they were knocked down from bases, and at the crater edge just a neglected heathen temple and several weird wooden plates with unknown hieroglyphs remained. The number of local inhabitants decreased not only because of incessant internecine wars. In 1862, slave traders from Peru stormed into the island, captured and took away about nine hundred people, including the last king. The captives were sent to extract fertilizers in the Atacama Desert. Later on, three hundred more natives of the island were captured and sent to Tahiti to work hard on plantations. And when the show war started in Easter Island, which was initiated by Dutrou-Bornier at a French company’s request, the rest of local inhabitants as well as missionaries abandoned the island totally. They then moved to the Gambier Archipelago located to the west. Thus, within 15 years the Easter Island population decreased from 2.5 thousand to 111 people! And those few people who decided to stay remembered nothing about centuries-old traditions of their forefathers. Interesting facts about the island inhabitants (see Figure 6). According to Helena Blavatsky, the multicoloured skin of local natives evidences that various peoples lived and mixed in Easter Island, including Lemurians (the third root race) and Atlanteans (the forth root race). Such information is contained in Blavatsky’s The Secret Doctrine, where Easter Island is mentioned as a dwelling place of the earliest generations of the third race. Unexpected volcano eruption and rise of the ocean bottom flooded Lemuria with all its monuments and culture. At that, the island remained intact as an evidence of Lemuria existence. There is another interpretation: the territory of Easter Island was occupied by several Atlanteans who were escaping a cataclysm that occurred in their places. They settled in the remaining part of Lemuria, but not for long, because it was later on ruined by volcano eruption and lava streams. Hence, it becomes clear that ancestors of black Lemurians and red-skinned and white-skinned Atlanteans mixed in this territory. • Orongo sanctuary at the border of Rano Kau extinct volcano. At that, Rano Raraku is a volcanic crater on the southern side of which ancient stone quarries have remained. Later on in the quarries huge sacred statues were cut out of the porous rock. This volcanic mount still preserves the consequences of a terrible civil war: many statues remained unfinished at various stages of completeness; some have only initial contours, others may be completed with several chisel movements for their separation from the rock and relocation; still others stand, lie or even ready for shipment. Rano Raraku itself is one of the most massive finished monuments with its peak situated 22 metres above the ground. At the volcano base there is a vast platform formed of basalt blocks; another similar platform is located below, right on the ocean coast. Its length makes up 50 metres. Whole fifteen stone idols stood on the lower platform in the past, though now all but one of them lie on the ground. The “short-eared” race totally exterminated bearers of the enigmatic culture of the “long-eared”, knocking their huge monuments down and breaking stones down to foundation. The weight of the largest idols reaches fifty tons. To hew them out, ancient people used stone hammers, axes and chisels, since local inhabitants could not produce tools of metal. The most unintelligible is the way how the statues were transported from the volcano to the platforms located near its base or at a considerable distance from it. In fact, there were not so many people on Easter Island to perform such works. Hence, we can assume the idols were transported by small groups of local inhabitants who used hard ropes made of reed or vegetable threads, wooden rollers and levers. Then the idols were installed vertically with accurate adjustment of a stone mound under their base. However, the work was not finished. Now, on the island where there is almost no plant cover, such monuments catch one’s eye everywhere. They stand or lie, incomplete or just started. The bloody civil war of the late 18th century caused collapse of these cult sculptures. It should be mentioned the statues were used not only as gravestones, but also had a certain spiritual purpose, which is evidenced by finds of the Orongo plateau stretching near the Rano Kau base southwest of Easter Island. In this area not far from the volcanic crater there are mysterious structures without window openings, made of bulky stone blocks. At that, there are numerous obscure images carved on rocks near these structures. The AllatRa book (I highly recommend it to all inquisitive minds) contains plenty of knowledge in various fields, but the knowledge in my opinion only lifts the veil of the unknown and serves as a mere indicator for seekers of the truth to search further. On the Point of View website whole article series has recently emerged, dedicated to the most ancient architectural objects and cult buildings on the planet. 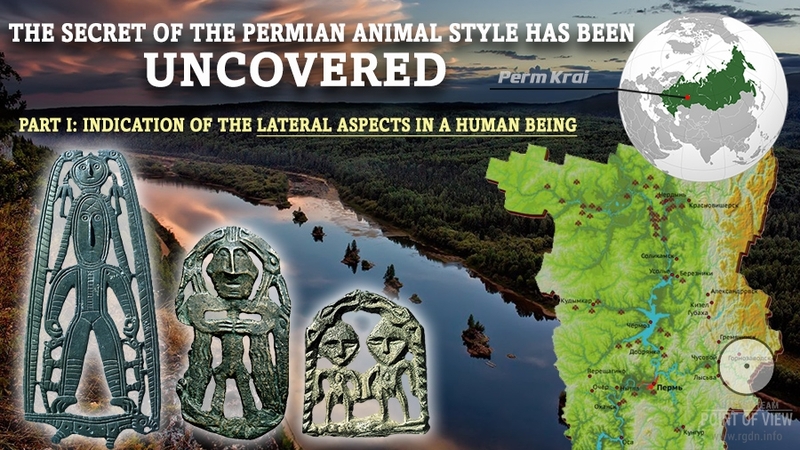 In these articles such objects are considered from the perspective of the primordial knowledge given in AllatRa, as a continuation of the ancient symbols subject addressed in the book. 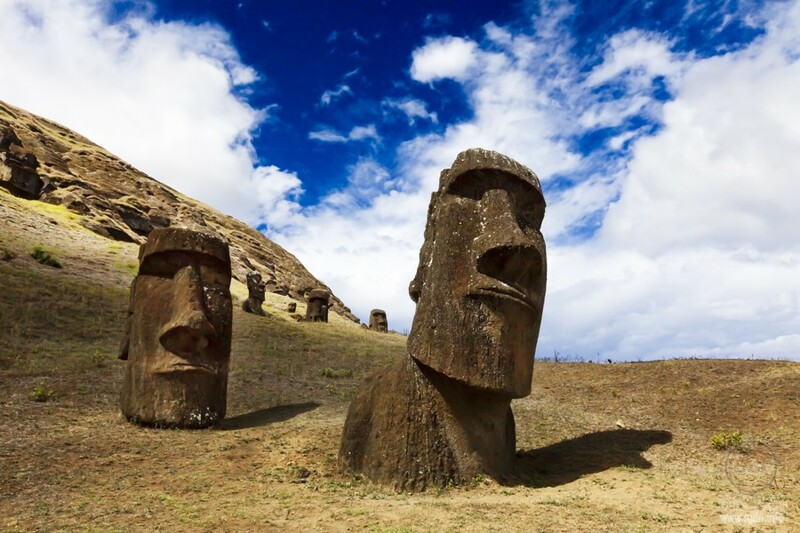 As for Easter Island in particular, a question arises why somebody needed to carve huge statues of stones on a tiny piece of dry land in the middle of the Pacific Ocean? If these are plain worship idols as many official historians assert, why weren’t they carved of palm or volcanic rock at the worst, and of the size of an ordinary man? It would thus be much faster and easier to transport the statues, and it would be more understandable how the transportation process was maintained in general. As of today there are many assumptions and hypotheses of how the multi-ton statues were relocated from the place of making to the place of their current location. 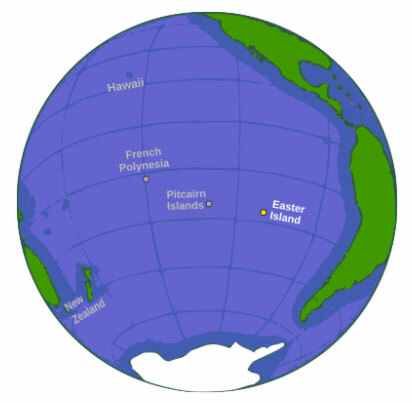 Brown and the rest of Pacifida adherents attempted to find at least some traces at the ocean bottom, neighbouring islands and even other continents. 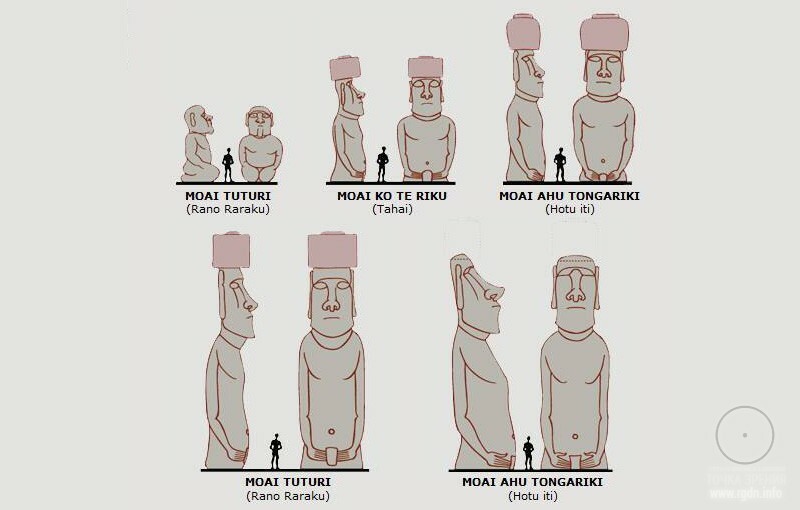 According to the British researcher, Moai Kavakava sculptures are somewhat similar to Indonesian puppets. 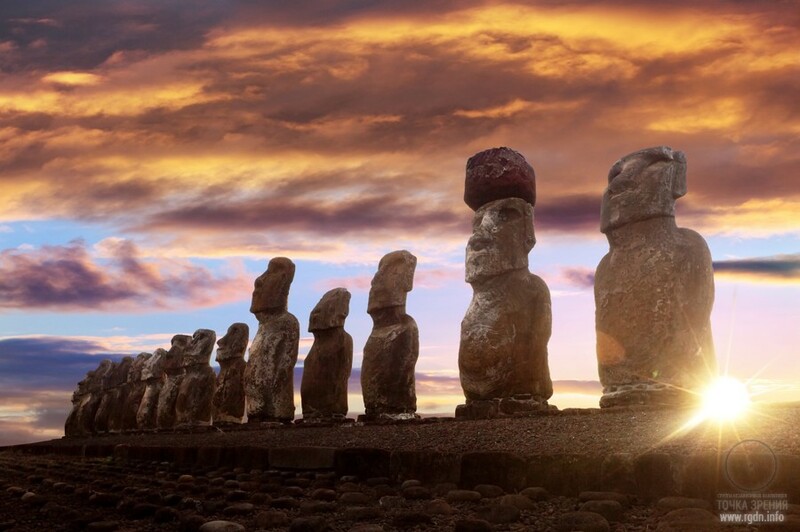 On certain islands strange marks of utterly lost inhabitants are found: thus, on the Coral Islands remains of ancient buildings were discovered, and on the Marquesas Islands there are huge petrified monuments that resemble Easter Island statues. Mysterious sculptures of the little Pitcairn Island are also cut out of stone. Furthermore, scientists studied scripts of various tribes. Figure 7 shows signs that may seem similar, although they are drawn in different prints and in different ways. The left column includes symbols of the Indus Valley, while the right column shows hieroglyphs on mysterious plates found on Easter Island. Such amazing likeness was revealed by the Hungarian linguist Simon Hevesi in 1932. The similarity is indisputable, as everyone can see with their own eyes. Kohau Rongorongo script contains about four hundred diverse symbols. Texts on ancient Hindu seals include approximately the same number of hieroglyphs out of which, according to Hevesi, nearly one hundred symbols match! A certain while later he identified one hundred seventy-four similar signs. If this is true, we cannot speak of any nonsensical coincidence. These sings do have one and the same root. French researcher Alfred Metro sharply criticized Hevesi’s assumption. In his opinion, the Hungarian linguist had a wrong view because he used random symbols from various scripts for comparison. At that, texts and inscriptions on the seals were executed not on modern equipment, but manually. As for me, I think such statement is extremely ridiculous, for the facts speak for themselves. In this case criticism was obviously made to order. It still remains obscure what the link is between inhabitants of the deserted tiny island in the Pacific Ocean and dwellers of the Indus Valley. They are separated by more than a half of the globe (!) – a distance of several thousand kilometres. Moreover, there is a giant gap not only in the distance, but in time as well. 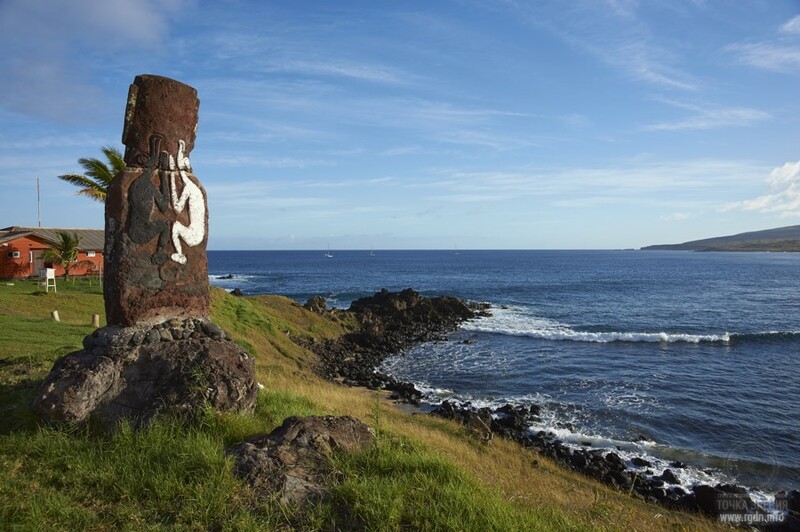 Rapa Nui inhabitants drew their symbols on plates in the second half of the 19th century AD (for one of extant plates a European oar was used as material), whereas texts on Indus Valley seals were carved five thousand years earlier! These peoples could not have jumped over such an enormous geographical distance and such a considerable time period! Hence, today it is still impossible to determine how they managed to adopt similar script elements without changing their outer contours, given the need to overcome the factors of nature and unfriendly tribes. The identity in symbols of these peoples definitely exists, and if science does not change the vector of its development towards a moral and spiritual one, it will make no headway, further turning a blind eye on evident things and executing orders of the servants of Archons. As ancient legends say, once a year priests addressed God with a request to appoint a new Birdman. A man appointed to this role had to organize a group of several guys and go to Rano Kau stone dwellings and caves together with them. There they waited (at times for several months) until seagulls inhabiting the island laid eggs on a cliff located several hundred feet away from the coast. Then the group swam towards the cliff called Motu Nui. The first man who reached it had to immediately search for an egg, then wash it and bring it intact to the island. Having done this, full of pride, he handed the egg over to the tribal chief who gained the Birdman status from that moment. Holding the egg in his palm, the chief walked along the entire southern coast of the island, making dancing movements, until he reached Rano Raraku. In this place he had to life for whole twelve months beside the stone dwellers of Rapa Nui. He stayed there totally alone, spending time in prayers and meditations. For the rest of Rapa Nui inhabitants this place of forbidden, for the respected Birdman’s chamber was arranged there. The main deity of this peculiar religion was Makemake who’s similar neither to the God-Lord we know nor to the Creator of the Universe. He, his companion – the sovereign of seagulls – and three deities-patrons of eggs and future progeny demanded human sacrifices. Probably, in ancient times cannibalism could be practiced on the island as well. 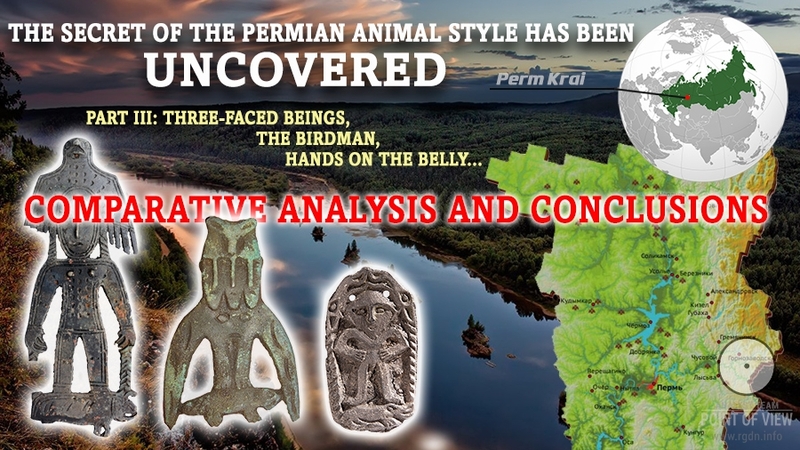 If we attentively study the Birdman legend and compare it with the primordial knowledge, we get a rather clear and logical picture. 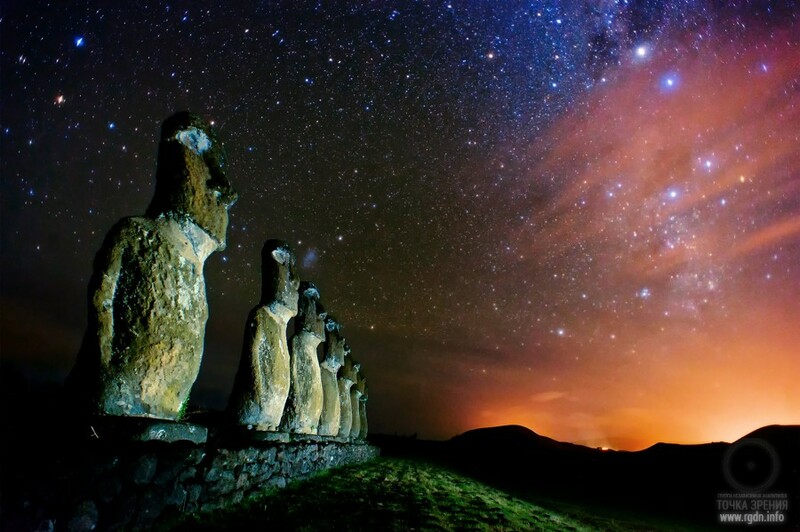 Let’s assume that, unlike our civilization, ancient inhabitants of Easter Island did not perceive the world materialistically, but lived with the prevalence of spiritual values. Could this be exactly the reason why some Europeans decided to ruin local culture so hastily? In such case, the election of the next Birdman (note that a bird is a symbol of the human Front Aspect) is nothing but election of the most spiritually evolved person to perform important tasks (management of climate, weather, seismic activity, perhaps even solution of some planetary tasks). For this purpose he gathered a group of young men to form a circle of power. Hence, it’s logical to assume what they were engaged in while staying in the cave together: they learned, regularly performed spiritual practices, and took care of their spiritual self-development and evolution. When the group was prepared, they underwent a sort of an exam or test of their knowledge and skills associated with the structure of the world (symbolized by the world egg). Thereafter, the Birdman started working with the largest ahu at Rano Raraku. This is evidenced by the symbols drawn on many statues. Perhaps, more attention should be paid to those symbols in order to understand signs with which the Birdman worked. The existence of a link between the Birdman cult and the massive stone idols is proved by images drawn on backs of most statues. The drawings depict skeletons, ghosts and deities, but most frequently the Birdman. 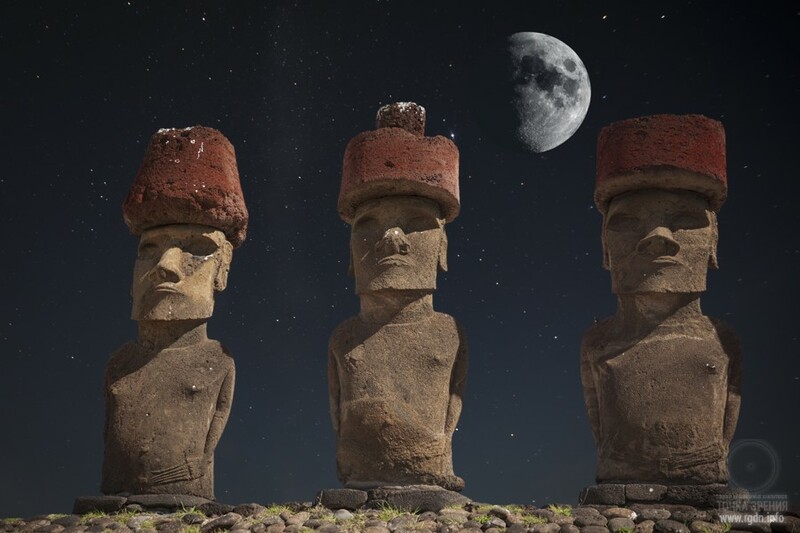 In 1722 the cult of the demigod and the huge idols was still actively promoted, but once the “short-eared” arrived at Rapa Nui everything drastically changed. Legends tell about several big boats with about three hundred men and, most probably, the same number of women. Scientists consider they escaped from Rapa Iti because a terrible civil war or sizzling drought started. Anastasia: Yes, but there are no signs on the stone heads and platforms located on Easter Island. It should be mentioned the original island culture did not vanish along with local inhabitants. In addition to worship of the Birdman and massive idols, the tribe of the “long-eared” possessed writing skills. Thus, the “short-eared” naturally managed to take advantage of the skills. In the first half of the 19th century, the last of the knowledgeable ariki named Nga'ara stayed to rule the island. He was white and short. The ruler accumulated a whole depository of symbol plates with hieroglyphs and taught peculiarities of the Rongorongo sacred script at school. Only the select few were sent to him for training, while all other inhabitants of the island were strictly forbidden to learn such things. They had no right even to touch the plates. Yet, those who were admitted to knowledge of the Rongorongo alphabet that included several hundreds of signs had to pass a special test. First and foremost, they had to learn to twist rope knots and silhouettes matching relevant hieroglyphs. It is known that similar tests were practiced in other parts of the planet as well. Anastasia: The importance of some signs, in my opinion, proves another fact of a kind of a “hunt” for them. Let us take, for instance, the story of the Easter Island ancient writing system. In that area, the knowledge about signs and symbols as well as their use in writing disappeared quite recently in the middle of the 19th century, when the island was invaded by the “Western civilization” represented by people who sailed on Dutch and Spanish ships. The world learned about the unusual writing system of the island from a Catholic missionary who visited the place. The locals of Easter Island kept records with special signs on wooden plates that were present in almost every home. Yet, having opened the signs of Easter Island to the Europeans, the said missionary and his followers at the same time did everything to destroy this writing system and burn it as pagan heresy. Thus, what has remained of this culture that existed just recently? Several hundred huge head sculptures as high as multi-storeyed buildings, weighing twenty or more tons and scattered throughout Easter Island, a couple dozen boards with literary texts that miraculously remained intact as well as a staff and a breast ornament with writings. At that, the latter are kept in different museums of the world. There is an impression that the world’s priests, having learned about these signs and symbols, did everything to destroy them, even despite the fact this was already a poor remnant of the former knowledge. indigenous inhabitants of Australia and East Asia, including Japan. In most cases diverse rope figurines are made for fun, but at the same time it’s often mentioned that, stretching a knitted silhouette on their fingers, aborigines pronounce ancient words with a magic meaning. Such witchcraft is particularly widespread in isolated territories of the Melanesian Basin, Micronesia, Polynesia, and among American Indians. As of today, scientists know about 3.5 thousand such figurines. They are made of an ordinary rope the edges of which are tied round, or of a twisted synthetic lace. In ancient times, in order to create magic patterns tribes used animal veins, intestinal fibres, joined or twisted vegetable threads, and at times even long human locks. Sometimes rituals are based on worship of spirits and mystical creatures. For example, Eskimos strongly believe knitted figurines have a soul, and they fear it a great deal because in their opinion it can be dangerous for their life. If somebody plays with ropes for too long or does it at a prohibited time, peculiar rustling is heard in front of the person’s dwelling, and the light inside the tent starts slowly going out. At that, only competent people understand this is how a knitted figurine spirit approaches. One the spirit removed internal organs from his dried-up body, and now he’s engaged in knitting himself, using dehydrated bowels. The process is accompanied with a sound similar to paper rustle. Quite interestingly, Navajo Indians who settled in the northwest of the United States of America are convinced that knot-making emerged in remote antiquity owing to a tribe of spider-men who taught other people this handicraft. Many nations knit figurines of laces in order to give them to their deities as a gift. Moreover, inhabitants of the Gilbert Islands in Micronesia believe such silhouettes appeared as long ago as upon creation of the world. There is a popular belief that says: “When upon the emergence of life the sky was cut off from the earth, a demigod rose, and while the sky was gradually “ascending” he knitted eleven knots one by one.” These knots are known in the Gilbert Islands even today, whereas Maude family even managed to photograph ten of them. It becomes clear why scientists still fail to interpret ancient notes and inscriptions that are more symbolical than alphabetical, further taking into account they have been just partially preserved. These neglected symbols actually explain real details and riddles of a much more ancient culture. Only twenty extant messages have been studied until now. They are kept in museums of Germany, Belgium, Chile, the USA, Russia, England, and Austria. If we don’t take into consideration the interpretation of Tepano Jaussen who gave decryption of about five hundred signs, the meaning of Rongorongo hieroglyphs has not been unravelled until today, provoking interesting conclusions. Similar scripts were spread among natives of Southwest India in the 4th millennium BC. Their culture vanished later on, too. Some historians believe that certain components of this culture, including the script, were brought to Polynesia approximately in the 2nd millennium BC. Then the tribe of the “long-eared” disseminated it to Rapa Nui island where they were kept for centuries or even millennia. That continued until all knowledgeable people and priests died, and so the unsolved mystery emerged for contemporary researchers. A certain sign-image and a certain melody represented a match for any figurine knitted of ropes, and the melody had to be learnt by rote. Hieroglyphs were not letters or phrases, but expressed some concepts and significant thoughts. There were obtained of volcanic glass by means of a chisel or carved with a shark tooth. Every line was drawn bottom-up. The lowest line was drawn from left to right, and the next one other way round. Furthermore, in every even line signs were drawn upside-down. Scientists called this peculiar script bustrophedon. However, such way of writing is rare in world philology. The enigmatic script remained unknown for many years; therefore Europeans discovered it not at once. The first records of the script appeared in 1817, when Tepano Jaussen started studying it in detail. He got totally amazed when he understood just a few literate islanders could read texts drawn on the plates, but they retold the essence in their own words, using signs only as tips. The information obtained from the tips was learnt by heart, though every person had mastered it in his or her own way. Here’s an interesting record from Wikipedia, which clearly indicates how Archons rooted out the Rongorongo culture through their people, in particular religious ministers. William J. Thomson was told of an old man called Ure Va‘e Iko who "professes to have been under instructions in the art of hieroglyphic reading at the time of the Peruvian raids, and claims to understand most of the characters". He had been the steward of King Nga‘ara, the last king said to have had knowledge of writing, and although he was not able to write himself, he knew many of the Rongorongo chants and was able to read at least one memorized text. When Thomson plied him with gifts and money to read the two tablets he had purchased, Ure "declined most positively to ruin his chances for salvation by doing what his Christian instructors had forbidden" and finally fled. However, Thomson had taken photographs of Jaussen's tablets and eventually cajoled Ure into reading from those photographs. The English-Tahitian landowner Alexander Salmon took down Ure's dictation, which he later translated into English. Thor Heyerdahl once decided to visit a shanty on Easter Island. The shanty owner Esteban Atan asserted he had a notebook written by his grandfather who had known the secrets of Kohau Rongorongo. The notebook contained major hieroglyphs of the ancient script as well as decryption of their meaning in Latin letters. However, when the researcher attempted to study the notebook, Esteban immediately concealed it. People who witnessed the events stated that shortly after they saw Esteban sailing towards Tahiti on a little boat. Most probably, the notebook was with him. Since that time nobody heard anything of Esteban, and it’s unknown what happened to the notebook either. At a certain point missionaries noticed a marvellous resemblance between the script of Easter Island and ancient Egyptian hieroglyphs. 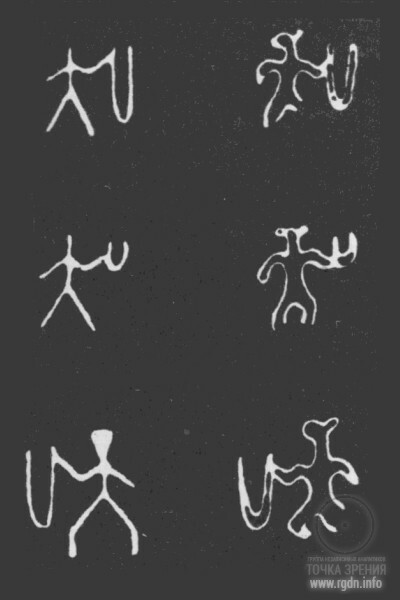 Moreover, it turned out that 175 signs of Kohau Rongorongo were absolutely identical with Hindustan inscriptions, whereas the signs likeness to ancient Chinese script was ascertained by the Austrian archaeologist Robert Teldern in 1951. American and German researchers are confident the script that once existed in Polynesia has been miraculously preserved and remained in Easter Island. The unusual indigene tradition to achieve stretched earlobes evidences the reverence of delicate ear abilities which used to be the major heritage of Lemurians. The latter could detect sounds which are absolutely inaudible for contemporary humanity. Such extraordinary hearing is also mentioned in the book Man: Fragments of Forgotten History where it is said such physical abilities emerged owing to perfection of one’s spirit. Certain people could hear sounds we are unable to hear, and that was the essence of their happiness. To revere such extraordinary gift, earlier Lemurian generations decorated themselves with stretched earlobes. Thus, they wanted to look like their remote ancestors. Carl Behrens loved to talk about the rich flora of Eater Island and enormous harvests of fruits and vegetables annually collected. Describing local inhabitants, he wrote the following: "The natives are always cheerful, well-shaped, they are excellent runners, friendly, but extremely fearful. Having brought us gifts, almost all of them hastily threw them to the ground and ran away at full speed.” As for their skin colour, it has diverse tints: there are black-skinned and totally white islanders, and there are even red-skinned ones who look as if they have got sunburnt. Their ears are long and often reach shoulders. Some natives have little white bars passed through their earlobes for decoration. 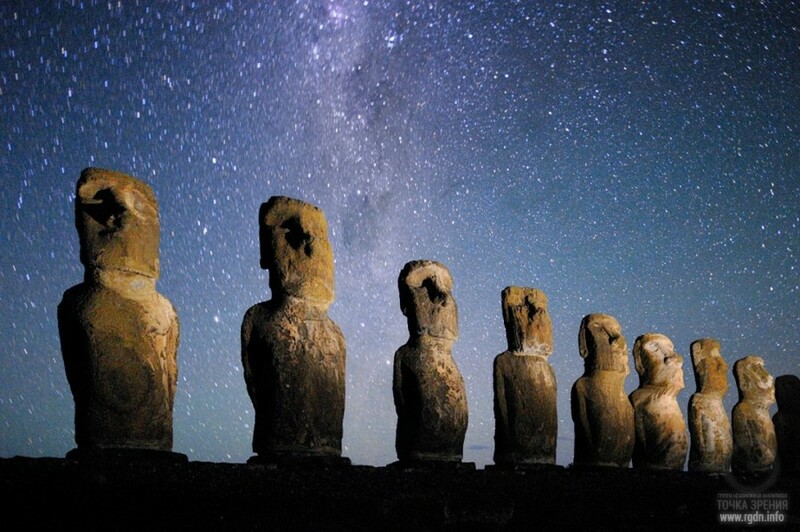 According to certain statements, the marvellous abilities of Rapa Nui inhabitants are due to the will of gods. Gods endowed them with such gifts for them to take care of the part of the world at which they look. Local dwellers have asserted their ancestors erected monuments that are famous nowadays, since they possessed an enormous strength. However, now such constructed is no more allowed. Having heard of such version, James Cook refused to believe it and even formulated the key riddles of the island: how the stone idols could have appeared, and why they did not appear anymore. Nonetheless, the islanders don’t support such assumption and refer to birdmen, i.e. deities who descended to the earth, installed the idols and flew away. 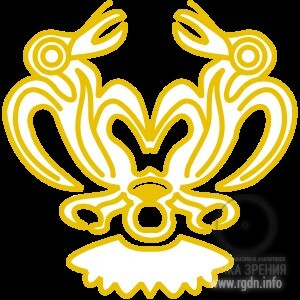 As a proof of the story, there are images of people with wings, which are found on the island. Thus, for a long time the Rapa Nui culture has been agitating the minds of researchers with its singularity and mysteriousness. Its messengers created unique stone monuments evidencing the high level of development of their civilization. All statues emerged between 1250 and 1500. As of today the number of idols is 887. At that, almost nothing is known about the inhabitants of Easter Island and their origin. When Europeans discovered the island in the 18th century they found just a retarded race of people who were totally unable to erect such monuments. And when the island was seized by slave traders several decades later, the very last remains of that civilization were buried. In an article published in the Antiquity journal archaeologists made a detailed review of numerous spearheads that were found all over the island. Relevant analysis shows the spearheads are totally unsuitable for hostilities. Such conclusion is based on the notion that the main purpose of a good weapon is to kill the enemy, while spears on Easter Island could only wound a person, not fatally. 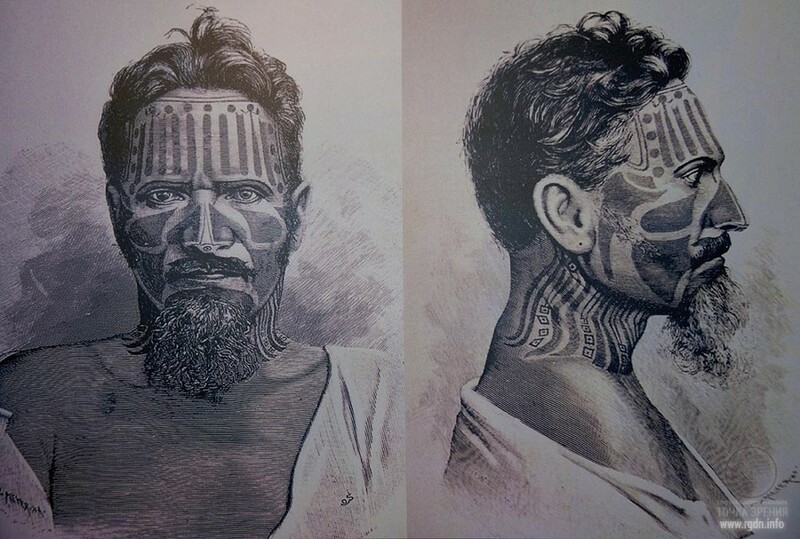 Hence, most probably, the spearheads served as tools for cultivation of land, food processing and application of various tattoos on local inhabitants’ bodies. Furthermore, there is no evidence of any large-scale and bloody wars on the island. Hence, it can be stated the ancient culture downfall was rather due to a lack of resources and to changes in the social and economic setup. Theoretically this civilization could have been revived, but the Europeans who arrived there prevented the possible revival. After familiarization with materials of various researchers and ordinary truth-seekers an impression arises that there is an interest in Easter Island, but the unavailability of genuine information leads a researcher either into the labyrinth of standard official theories or to a conclusion that we will never discover the truth. 1. 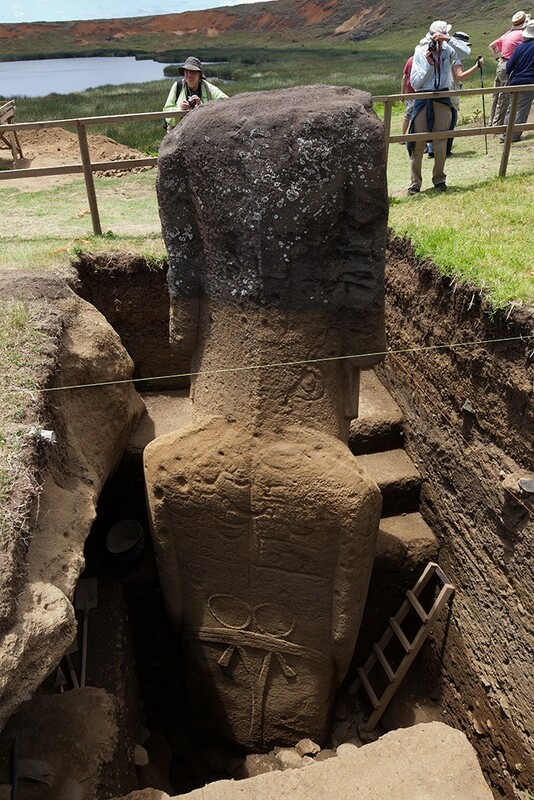 There are several types of moai (statues) on the island: some of them have been placed on pedestals recently, others are scattered around the island; still others are partially buried in the ground, sometimes quite deep. 2. Moreover, the statues differ in size and appearance, because they were apparently made at various times. 3. 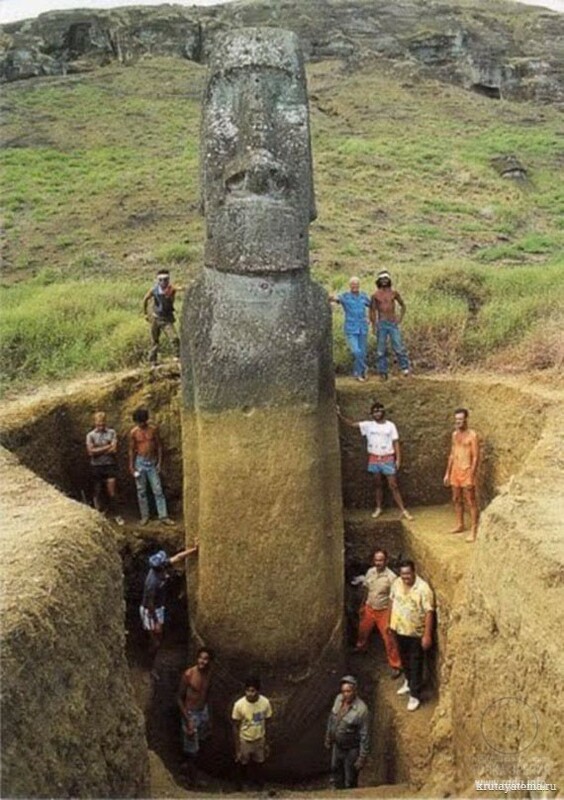 As of today, official science claims the moai were created approximately between 1200 and 1400 AD, and those standing in the ground up to their shoulders have got covered with sand and earth in the course of time. Yet, how much time does nature need to raise the level of ground by 2-3 metres or more? Something is wrong here for sure. 4. There are several traditions on the island, which vaguely resemble actions of people who possessed spiritual knowledge of the human being and the world (skin whitening, the Birdman cult). 5. Despite numerous riddles and open opportunities for the island exploration, local authorities carry out no official scientific studies. Furthermore, such studies are tabooed, excavations are prohibited, and underwater research near the island is not allowed either. Whoever risks explore anything here will get a warning from police or intelligence services and may even be imprisoned. There are plenty of relevant examples. Even that what was excavated by Thor Heyerdahl has been buried. It looks like somebody is afraid people will find out the truth preserved in the island artefacts, and such approach is the same in many places of such kind across the world. Archons’ activities definitely deserve thorough investigation, since understanding of their influence methods, which remain unchanged for ages, will enable humanity to reveal their actions in the society’s everyday life and expose them to the general view. 6. A very interesting topic is the script that used to be on the island and was promptly ruined once the Europeans arrived. 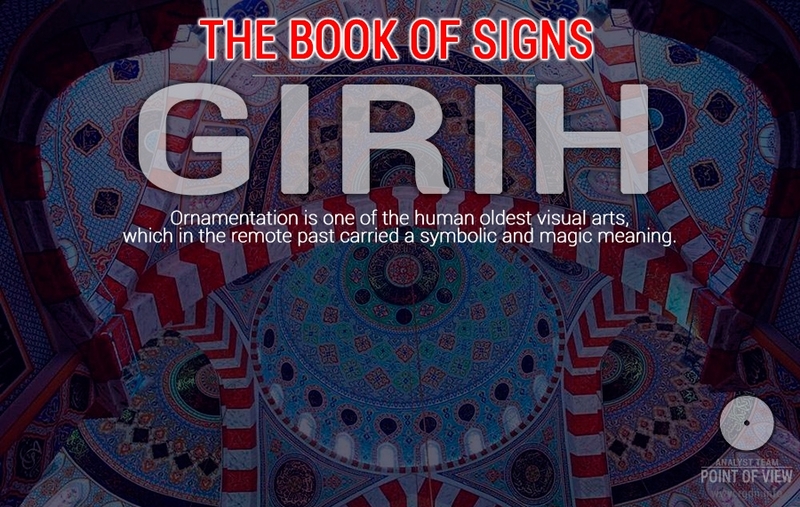 In less than a century there remained nobody who would know how to read and write traditional local signs and symbols, and those who still remembered the script avoided researchers like fire. Apparently, their experience with foreign researchers was quite bitter. 7. In view of the aforesaid, it is obvious that prior to arrival of the Europeans an ancient culture existed on the island in which people preserved the genuine knowledge and not just preserved, but actively applied it as well. For instance, the “plasticine” technology of stone processing (when a stone turned as plastic as plasticine), cutting and transportation of multi-ton statues, three-layered ahu (platforms) with the lower layer faced with polygonal masonry like many other megalithic structures on different continents. The very fact of the statues creation and placement along the island perimeter indicates it was necessary (at least for the local population). Taking into account those were knowledgeable spiritual people as we’ve already ascertained, such necessity could be due to creation of certain conditions for the entire world or its part, since “moai possess the power of northern winds and are responsible for the part of the world towards which they look.” Those could be both climatic and spiritual conditions, and perhaps Rigden Djappo will consider it appropriate to disclose the true purpose and the sacred meaning of the statues. 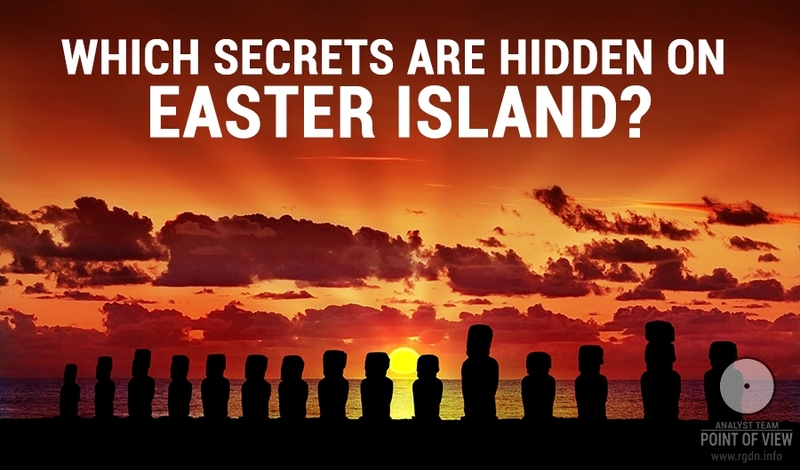 Therefore, still today many secrets of Easter Island remain unresolved, and answers to questions that interest researchers might possibly be lost forever. Nonetheless, for as long as studies continue, people keep hoping to solve the puzzle created many centuries ago.